This weekend's riding was pretty insane! Saturday I hit up The Lot for a few hours to watch a bunch of guys huck themselves off the freshly groomed jumps. Blachura and Erik Z. were going huge and Dave was firing out flip whip attempts one after the other...coming oh so close! Guaranteed he has them dialed by next weekend! A few dudes from UCONN showed up and were getting pretty comfy on the jumps. Always a good session when lots of heads are at The Lot! Sunday was a really fun day, despite the chilly low 40 temps. Tiny TYRANT, T, and I met up with Schmidt and Sean Milnes and we road tripped it up to Matty Still's place to get our day of riding started. 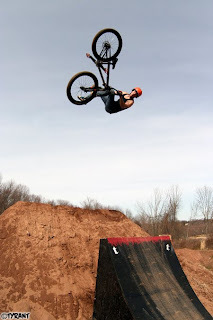 We hit up the Belchertown Park for a bit, but the place was pretty shotty. Schmidt was blasting a few gaps and Sean was getting rad on his fixie. Jay Bych and Danny Todd joined the caravan at B-Town and we made our way to the Northampton Park for an hour or so. 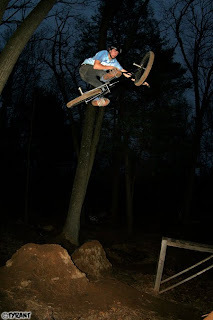 The temps were dropping and we still has plans to hit up the trails in Northern CT before dark, so we skipped out of Mass around 5 and headed South. Jay lead us to his local trails and the place was pretty bonkers! He had some lines dialed with ease, and Schmidt and Brandon we're getting comfortable on their bikes as dark fell. Props to Schmidt for strapping on a set and hitting a huge jump that supposedly nobody has ever cleared. Props also go to Tiny TYRANT for hitting the same jump brakeless...and over shooting it! Damn kids! It was cool to see T and Sean pumping the roller sections and jumping some stuff, both a bit out of their element on dirt...but riding just fine! All in all it was a super fun day! Can't wait for the warm temps to return and more of these trip to go down!! !